Steinke, V. A. & Saito, C. H. Priority wetlands for conservation of waterbird�s diversity in the Mirim lagoon catchement area (Brazil-Uruguay). Pan-American Journal of Aquatic Sciences, 8(4): 221-239. Download PDF file (1,233 Kb). Costa, C. F., Sassi, R. & Gorlach-Lira, K. Diversity and seasonal fluctuations of microsymbionts associated with some scleractinian corals of the Pic�ozinho reefs of Para�ba State, Brazil. Pan-American Journal of Aquatic Sciences, 8(4): 240-252. Download PDF file (350 Kb). Costa, C. F., Sassi, R., Gorlach-Lira, K., LaJeunesse, T. & Fitt, W. K. Pan-American Journal of Aquatic Sciences (2013), 8(4):253-264 Seasonal changes in zooxanthellae harbored by zoanthids (Cnidaria, Zoanthidea) from coastal reefs in northeastern Brazil. Pan-American Journal of Aquatic Sciences, 8(4): 253-364. Download PDF file (374 Kb). Copatti, C. E., Fagundes, L. S., Quaini, J. B. & Copatti, B. R. Diversity of aquatic arthropods on Eichhornia crassipes (Mart.) Solms roots before and after removal of substrate in a reservoir in southern Brazil. Pan-American Journal of Aquatic Sciences, 8(4): 265-275. Download PDF file (430 Kb). Accioly, I. V., Lima-Filho, P. A., Santos, T. L., Barbosa, A. C. A, Santos Campos, L. B., Souza, J. V., Ara�jo, W. C. & Molina, W. F. Sexual dimorphism in Litopenaeus vannamei (Decapoda) identified by geometric morphometrics. Pan-American Journal of Aquatic Sciences, 8(4): 276-281. Download PDF file (377 Kb). Braga, C. F, Da Silva, R. F., Filho, J. S. R. & Beasley, C. R. Spatio-temporal changes in macroinfaunal assemblages of tropical saltmarshes, northern Brazil. Pan-American Journal of Aquatic Sciences, 8(4): 282-298. Download PDF file (729 Kb). M�ndez, N. Trophic categories of soft-bottoms epibenthic deep-sea polychaetes from the southeastern Gulf of California (Mexico) in relation with environmental variables. Pan-American Journal of Aquatic Sciences, 8(4): 299-311. Download PDF file (299 Kb). Buruaem, L. M., Araujo, G. S., Rosa, P. A., Nicodemo, S. C., Porto, V. F., Fonseca, J. R., Cruz, J. V. & Medeiros, G. F. Assessment of sediment toxicity from the Areia Branca off-shore harbor and the Potengi river estuary (RN), Northeastern Brazil. Pan-American Journal of Aquatic Sciences, 8(4): 312-326. Download PDF file (971 Kb). Morais, L. G., Perina, F. C., Davanso, M. B., Buruaem, L. M., Rodrigues, V. G. S., S�golo, J. B. & Abessa, D. M. S. Water and sediment ecotoxicological assessment in a river affected by former mining activities. Pan-American Journal of Aquatic Sciences, 8(4): 327-338. Download PDF file (578 Kb). Tischer, M., Silva J�nior, J. M. & Silva, F. J. L. Interaction of spinner dolphins (Stenella longirostris) (Cetacea, Delphinidae) with boats at the Archipelago of Fernando de Noronha, Brazil. Pan-American Journal of Aquatic Sciences, 8(4): 339-346. Download PDF file (289 Kb). Bastos, R. F., Condini, M. V. & Garcia, A. M. Fish species list of coastal streams in southern Brazil, with notes on austral distribution limits of marine and freshwater endangered species. Pan-American Journal of Aquatic Sciences, 8(4): 347-351. Download PDF file (198 Kb). Tavares, D. C. & Siciliano, S. Notes on records of Ciconia maguari (Gmelin, 1789) (Aves, Ciconiidae) on northern Rio de Janeiro State, Southeast Brazil. Pan-American Journal of Aquatic Sciences, 8(4): 352-357. Download PDF file (541 Kb). Freita, F. R. V, Santana, N. N., Landim, F. G. S., Peixoto, B. M. J. & Pinheiro, A. P. Occurrence of Goyazana castelnaui (H. Milne-Edwards, 1853) (Crustacea: Decapoda: Trichodactylidae) in the semi-arid region of the state of Pernambuco, Brazil. Pan-American Journal of Aquatic Sciences, 8(4): 358-360. Download PDF file (240 Kb). Gomes, L. E. O. & Silva, E. C. New record of Isognomon bicolor (C. B. Adams, 1845) (Bivalvia, Isognomonidae) to Bahia Litoral North. Pan-American Journal of Aquatic Sciences, 8(4): 361-363. Download PDF file (366 Kb). Batista, V. G., Affonso, I. P., Hanisch, R. F. & Oda, F. H. Predation on Eupemphix nattereri Steindachner, 1863 (Anura, Leiuperidae) by giant water bugs, Lethocerus delpontei De Carlo, 1930 and L. annulipes (Herrich-Sch�ffer, 1845) (Hemiptera, Belostomatidae). 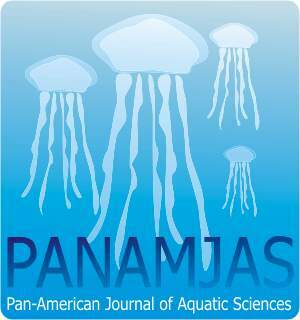 Pan-American Journal of Aquatic Sciences, 8(4): 364-368. Download PDF file (363 Kb). Paschoal, L. R. P., Andrade, D. P. & Darrigran, G. Size comparison of quadrats in sample of non-native bivalve Corbicula fluminea (M�ller, 1774) (Bivalvia: Corbiculidae). Pan-American Journal of Aquatic Sciences, 8(4): 369-374. Download PDF file (497 Kb).